I develop software for hydraulic simulations of flooding, create web applications and maps, dabble in hydrology, and sometimes politics. My academic research focuses on how to incorporate complex hydraulic and hydrological processes across large spatial extents in models, to simulate entire catchment systems without compromising accuracy. 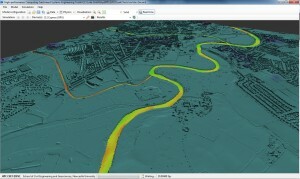 The techniques developed are appropriate for nowcasting urban flood events, designing and evaluating 'natural flood management' features, assessing the impacts of dam failure or defence breaches, and forecasting flood inundation in urban areas. I'm currently Technical Architect at the Urban Observatory, at Newcastle University. I'm also Technical Director of grough, where we provide our own national mapping product for the outdoors, and a web application to plan routes. The high-performance integrated modelling system (HiPIMS) is a flexible integrated framework for hydraulic and hydrological modelling of catchment systems. Developed in C++ and OpenCL, it supports Unix and Windows systems and leverages the parallel processing power of CPU and GPU devices from Intel, AMD, and NVIDIA. Console and GUI versions of the software with a single XML-format configuration file and support for all common GIS data formats. Real-time 3D visualisations of flow data within the GUI version of the software. A range of numerical schemes are available for solving the shallow-water equations, including a second-order accurate MUSCL-Hancock approach, a first-order Godunov-type scheme, and a partial inertial approximation. A resilient approach to hydrodynamics which is shock-capturing, numerically stable, and prevents the occurence of negative water depths. Tested against analytical test cases and real-world applications, with demonstrable improvements in parameter sensitivity and performance for high-resolution simulations with millions of grid cells. You can download the current version of HiPIMS, including the source code, on GitHub. Please get in touch if you would like presentation slides or more information. Whenever possible you will find an open version of each paper, which is identical in content but not typeset in the same format as the journal publication. Liang Q, Smith LS, Xia X (2016) New prospects for computational hydraulics by leveraging high-performance heterogeneous computing techniques, Journal of Hydrodynamics Ser. B, 28(6):977-985. Rashid AA, Liang Q, Dawson RJ, Smith LS (2016) Calibrating a High-Performance Hydrodynamic Model for Broad-scale Flood Simulation: Application to Thames Estuary, London, UK, Procedia Engineering, 154:967-974. Amouzgar R, Liang Q, Smith LS (2014) A GPU-accelerated shallow flow model for tsunami simulations, Proceedings of the ICE - Engineering and Computational Mechanics, 167(EM3):117-125. Smith LS, Liang Q, James P, Lin W (2014) Crowd-sourcing for a flood resilient city, Circulation (British Hydrological Society), 120:4-5. Liang Q, Smith LS (2013) A GPU-Accelerated Hydrodynamic Model for Urban Flood Inundation, Proceedings of the 35th IAHR World Congress, 8-13 September 2013, Chengdu China.